I’ve been working on the Liminals Series concept for about a year and a half now, and it’s wonderful to finally share the first installment with you. Meriwether Storm discovered the grisly remains of her parents on their living room floor when she was only fourteen, the result of a failed daemon summoning. Meri immediately swore vengeance on the daemon who’d killed her parents, but there was only one problem–she had no idea which one had committed the atrocity. Before their untimely deaths her parents had trained her intensively in the arts, and Meri used her skills to follow in their footsteps, ever seeking the daemon’s name. Now, despite her years of searching, she’s no closer to the truth and her time is running out. 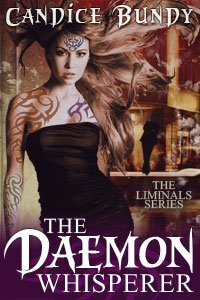 Will she accept a deal from a daemon if it means finally learning the truth? When retribution is the only thing that drives you, how much are you willing to sacrifice before you lose yourself to the cause? I urge you to go and read Chapter 1 and decide for yourself if this book appeals to you. It’s an Urban Fantasy / Paranormal Romance with horror themes. If it does sound interesting, hop on over to Amazon and pick yourself up a copy. It’s available in eBook now, and will be out in paperback form in November. If you’re a Goodreads user, you can also find the book here. Even better, enter to win one of two free copies on the Goodreads eBook giveaway by midnight tonight! You never know — you might just get lucky! Also, next Monday night 10/8 I’m hosting an online facebook (on my fb author page) and twitter (#tdw) launch party at 8-9pm MST, where I’ll answer questions and post factoids about the book/series for your amusement. See you then! woohoo, release day! 😀 That cover is amazing! And I’m dashing off to GR to see about adding this to my shelves! ^_^ congrats! Congratulations and good luck. Hope you blow the doors out.